Many of us are involved in one way or another in some form of networking, be it a formal group like BNI or Rainmakers, or just the informal behavior of being a connector and a good networker wherever you may be. So, how does a CRM help with that? 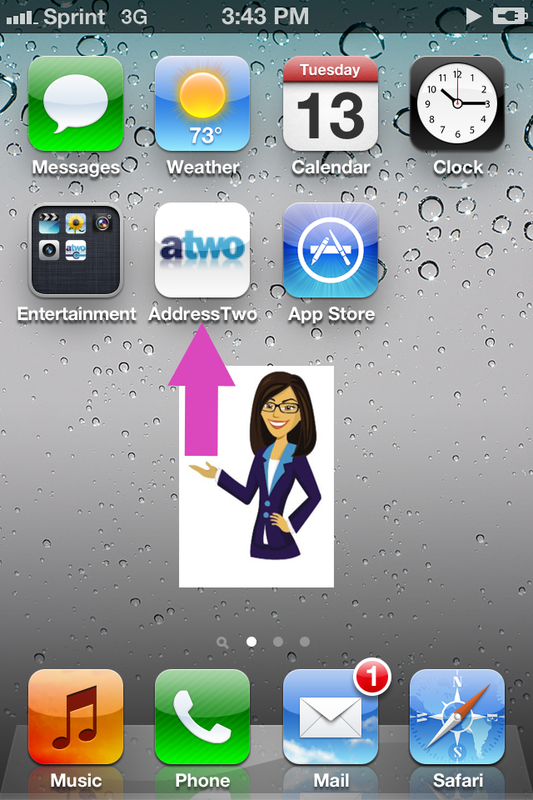 There are two ways to send a referral using AddressTwo. I'll cover both, starting with the simplest. The simplest way is to click the "send referral" button atop any Account View (shown below). 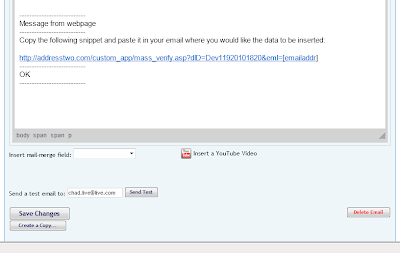 Now, using this method there will be an option offered to "Send a copy of this email to the referral contact." You will find this checkbox at the final step just before sending the referral. Some confusion has arose surrounding this option so, allow me to clarify. It does indeed send a copy of the very same message (literally, adding a CC to the notification email) that is being sent to the referral recipient. That means, if person A is being referred to person B, you can use this to notify person A that he/she is being referred. That is all. It does not send an inverse message whereby person B's contact information is sent to person A. Why does that confuse some users? Because, there is another method that you can use which will indeed send two distinct messages, one sending person A's contact data to person B, and the second doing the exact inverse. 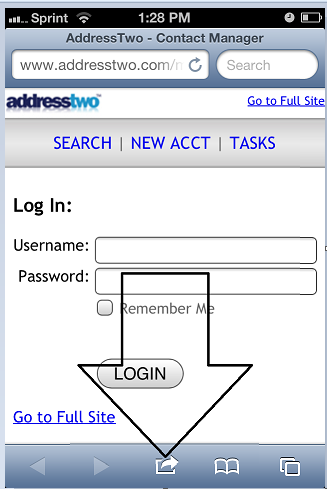 both recipients' email addresses need to be found on a contact within AddressTwo. Subject line needs to begin with the 7 characters: "e-intro" ... you can add anything you'd like after that. You can invite your contacts to verify and update their information in Address Two with the Verification button from the account view. 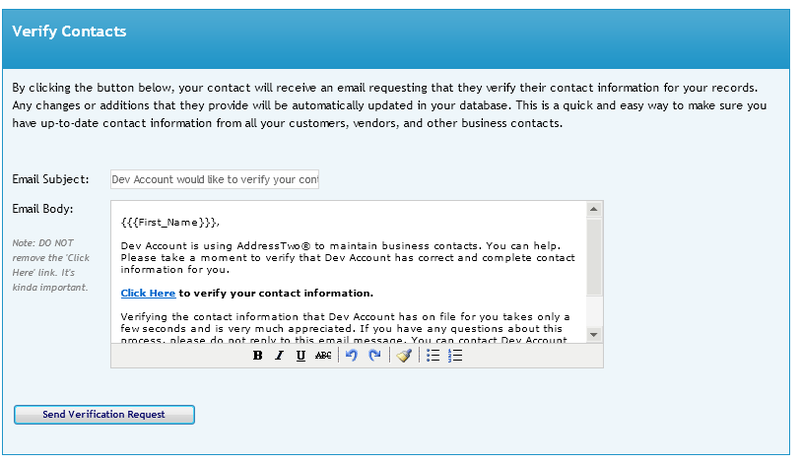 Clicking this button will send an customizable email to the contacts in the account. 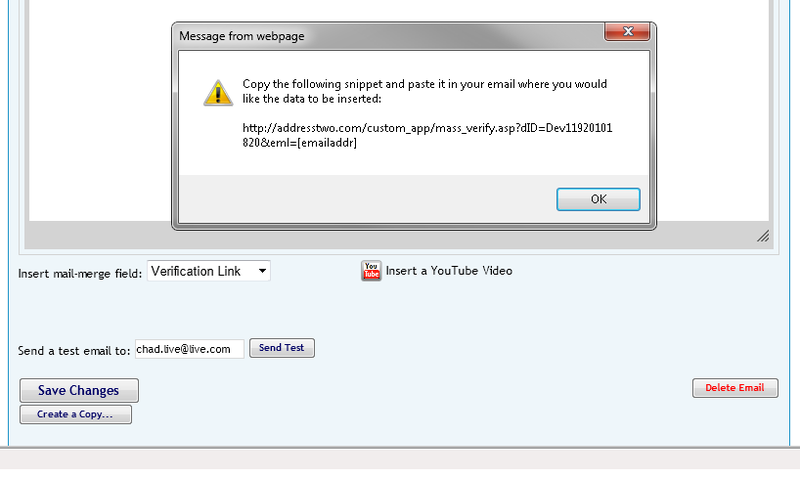 This will send an email with a link to your contacts to verify their contact information. 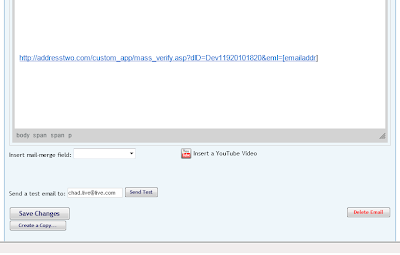 You can also create a custom email template with a link to the verification form. 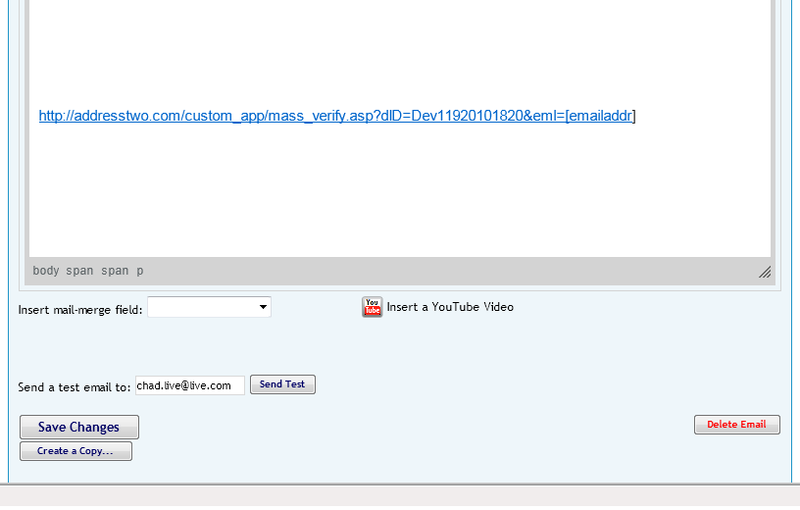 There is now a merge link for the verification link. 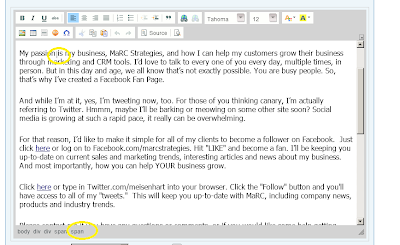 The merge link will pop up a window with the link. 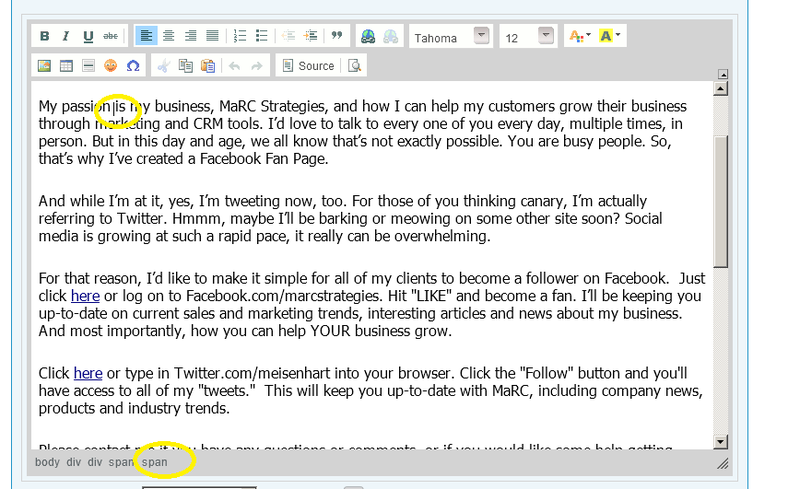 You can click Ctrl-c to copy the window and paste the results into the email template. With this URL, you can link some text to the verification form. Enable Addy Email Verification: at the bottom of the screen. 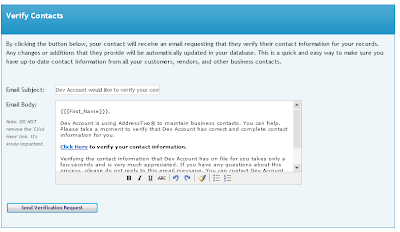 One of the earliest features of AddressTwo has been our free contact forms. If you haven't already taken advantage of this capability, it's free to all users. 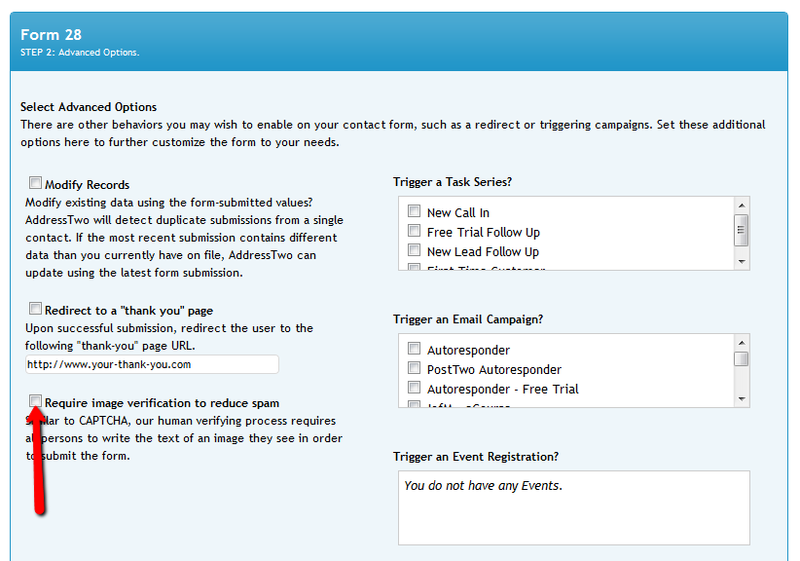 You can embed our form as the "contact-us" form on your website and have leads automatically inserted into your CRM. 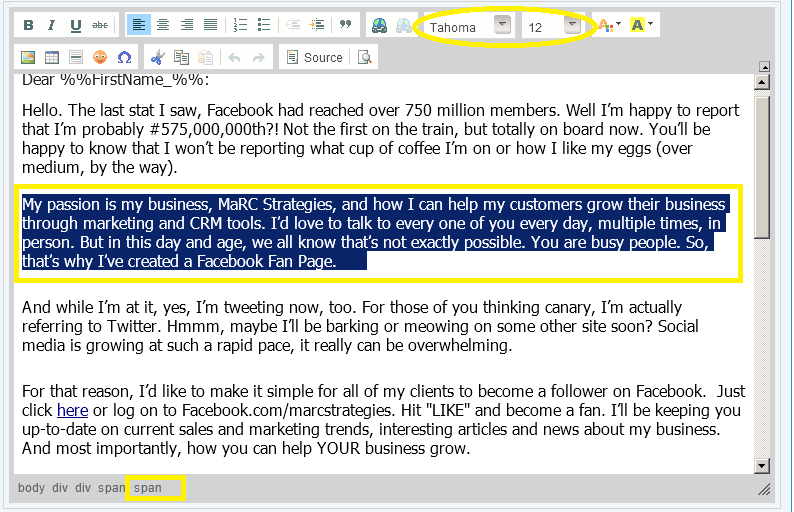 There are a number of more advanced features, too, including custom fields, lead-routing, triggering campaigns, tasks, etc. But, as our popularity has grown, some spammers have taken notice of our forms becoming prolific on websites all over the internet. They directed their attention toward beating our anti-spam alogrithm... and after four years, they've cracked it. So, that means it was time to innovate again... and we did. 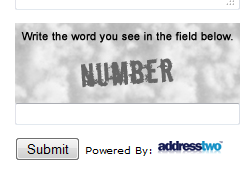 Webforms now include an image verification option. You can turn this on or off when creating forms by checking the box seen below. Now, you may wonder: why wait so long to add this feature? Simple: our anti-spam methods previously had been highly effective without needing to require users to take extra steps to verify their identity. The truth is that using image verification has been shown to reduce the conversions on a form because some would-be leads are unable to get the word right (be it from poor vision, or just fat-fingers). So, we relied on other anti-spam methods. And by-and-large those methods have worked to-date and continue to work for many of our customers. What does that mean for you? Well, as neat as this shiny new feature may be, I must say that you should still consider carefully whether you want to use it. If your webform is on a relatively low traffic website (<10,000 hits per month) and if your webform is NOT found on the home page, but rather some deeper navigation page where users must click to find it, then you could be safe without the image verification. Spam bots go after the obvious targets, and are not likely to find your form if the above criteria are met. We resisted using this anti-spam method until recently and even now recommend that you choose wisely whether you wish to add it to your own webforms. If you have high-traffic forms and have experienced the frustration of form-spam in the past, the solution is here and it's easier to implement than Captcha or similar solutions. Just check the box, we'll take care of the rest.